James Tynion IV to write one-shot origin story for the newest Dark Knight, the Grim Knight – AiPT! Tynion will pen the story of an encounter we’ve never imagined between a young Bruce Wayne and his parent’s killer. AiPT! :James Tynion’s The Batman Who Laughs was one of the best one-shots, and one of the darkest DC Comics I’ve read in years and I loved it. I’ve re-read it like ten times. Snyder: Oh yeah. By the way, I’ll tell you a spoiler: James is actually going to be doing a one-shot for the Grim Knight, the same way he did for this. So you’ll get his origin on his world as well. Tynion’s one-shot will focus on the newest Dark Knight to be recruited by The Batman Who Laughs, The Grim Knight — a Bruce Wayne who as a child picked up the gun Joe Chill used to murder Thomas and Martha Wayne, and turned it on their murderer, breaking the most sacred rule and conviction Batman follows — no killing. 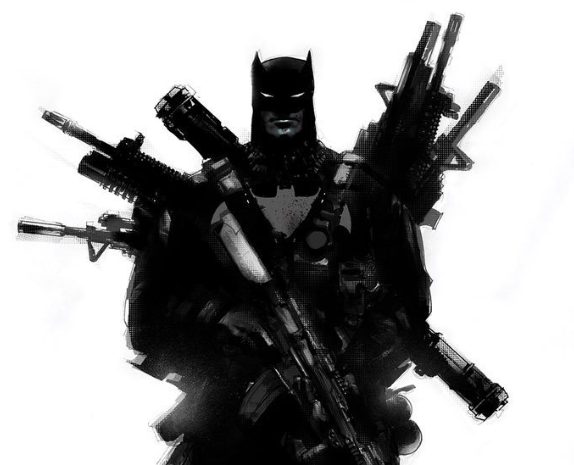 Snyder has described this Batman as akin to the Punisher, toting a vast array of guns, and having no qualms in using them to mow down criminals. But perhaps even more dangerous is the immense wealth and resources of his multi-billion corporation and the military industrial complex behind him. In addition to his arsenal of weapons, Wayne Enterprises allows him to be in your car’s GPS, your home’s air conditioning and your work’s telephones — there are so many ways this Batman can kill you, it’s not even funny. This isn’t the first time Tynion will be writing an origin story for one of Snyder’s creations and it isn’t his first experience with Metal storytelling either. The Batman Who Laughs’ one-shot origin story which received high praise from critics and fans alike, was penned by Tynion. He also wrote Batman Lost, and co-wrote Dark Knights Rising: The Wild Hunt, Dark Days: The Casting, and Dark Days: The Forge. There’s no official word from DC at this time on when the book will be released, but given that issue one of Snyder’s new The Batman Who Laughs series goes on sale December 12, the holiday season is a safe bet.